Some people called him “Cowboy”, others called him “Lefty”. But it is rather shameful he can’t be called “Hall of Famer”. It’s a designation that hasn’t been bestowed to him by the Naismith Memorial Basketball Hall of Fame, but it’s one he deserves from them and any other basketball institution. Edwards hailed from Indianapolis but briefly played college ball at the University of Kentucky. The 6’5″ center was stronger and more athletic than most of his contemporaries and had a dreadnought hook shot with either hand. His one year of varsity ball was so dominating that the NCAA instituted the three-second rule for offensive players in the key. But Edwards did indeed play just that one varsity year with the Wildcats. He left college ball in 1935 to get a paycheck from professional teams. During 1935, ’36, and ’37, Edwards returned home to Indianapolis playing for U.S. Tires and the Indianapolis Kautskys, both members of the Midwest Basketball Conference. In 1937, the league reorganized itself as the National Basketball League (NBL) and Edwards headed north to the Oshkosh All-Stars where he’d perform his greatest work. Well, Edwards is big enough and tough enough to “halfback” his way in if occasion demands, but he also is nifty and clever enough to gain the same end by finesse if the opposition abides by the rules. In regular league play, Edwards sternly “halfbacked” to the NBL in scoring title in the 1937-38 season and did so again in the 1938-39 season… and again in the 1939-40 season. He was also named the inaugural MVP of the NBL in 1937-38 and was named MVP again in 1938-39… and again in 1939-40. All three of those seasons the Oshkosh All-Stars made the NBL Finals, but were defeated each time. Not that Edwards was any less dominant in these series than he usually was. 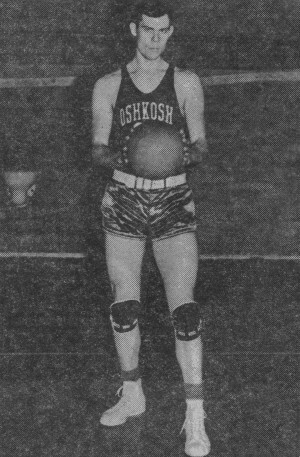 For example, in Game 1 of the 1938 Finals he dropped 13 of Oshkosh’s 28 points in a 29-28 loss to the Akron Wingfoots. In Game 2, Oshkosh won 39 to 31 thanks Edwards’ 16 points. But in the deciding Game 3, future teammate Charley Shipp flummoxed Edwards into just 9 points and Akron took the title. Finally, in 1941, the All-Stars made up for their disappointments and took home the NBL title defeating the in-state rivals, Sheboygan Redskins. Edwards averaged a scintillating 14 points for the series – keep in mind that the average team score was 40 points that year. In 1942, the All-Stars repeated as NBL champs in perhaps the finest moment in Edwards’ great career. In Game 1, he got into a scoring duel with the sharp-shooting Bob McDermott of the Fort Wayne Pistons. McDermott netted 20 points while Edwards mustered a game-high 22, but the Pistons wiped the floor with Oshkosh by a final score of 61 – 43. In Game 2, Edwards went bonkers destroying the Pistons by setting an NBL record of 35 points. The All-Stars walked away with a 68-60 win. The decisive Game 3 saw Edwards score just a single point, but his huge impact was still felt. The Pistons, frightened he might uncork another monstrous 35-point game, double-teamed him constantly every time down the court and that opened up the avenues for his teammates to carve up Fort Wayne. To boot, defensive ace Charley Shipp, now on the side of the All-Stars, hounded McDermott into a miserable performance as Oshkosh prevailed 52 – 46. Edwards would play with the All-Stars through 1949 and the team was always successful but would never again win, or appear, in another NBL Final. But Edwards kept on mack truckin’. Sure Mikan grossly overestimated Lefty’s height (perhaps to ironically save face). After all, our memories do tend to exaggerate circumstances of the past. But memories usually get the essence of the story right. When it comes to Leroy Edwards the essential story is one of destructive offensive force, a pair of sharp elbows, three-time MVP, two-time champion, and unfortunately, one of pro basketball’s overlooked titans.